Survived by his wife Bharti and two sons, Nayar was born in Sialkot (now in Pakistan) in 1923 and graduated in Law. He also studied journalism and began his career with an Urdu newspaper called Anjam. New Delhi: One wintery evening in the 1970s, as Nalini Singh waited for Kuldip Nayar outside his office at The Statesman building, he came out to explain the delay. “What he said has stayed me with all these years. He said, ‘I was reading the ‘letters to the editor’ and responding to them…you know, this is the most important thing I do. It keeps me informed’,” recalled Singh. On Thursday afternoon, a sea of politicians – from former Prime Minister Manmohan Singh, Delhi Chief Minister Arvind Kejriwal and Delhi deputy CM Manish Sisodia to Union ministers Dr Harsh Vardhan and Rajyavardhan Singh Rathore, as well as former Rajya Sabha MP and former editor of The Indian Express Arun Shourie – turned up at the Lodhi Crematorium, along with journalists and photographers to hile Rathore called him “an institution, not just a journalist”, Vardhan said, “He was there whenever the country needed him through his pen…he was committed to Rashtra dharma”. In a letter to Nayar’s wife Bharti, Singh expressed his condolences and said, “He served the country in various capacities with great distinction. He was a veteran journalist, diplomat, parliamentarian, and author”. Kejriwal tweeted, “Sad news coming in about the passing away of noted journalist and human rights crusader Kuldip Nayyar. He will be missed for his fight for press freedom and democratic values in these testing times. A huge loss to the nation”. Journalist-turned-politician MJ Akbar said, “He (Nayar) gave us the biggest story of our lives: that Indira Gandhi had called for early elections in 1977 after the Emergency. It’s the end of an era, we all love him”.pay their last respec alling Nayar the “voice of the nation”, Swaraj India leader Yogendra Yadav said at a time when the foundation of the Republic was shaken, one needed to look up to Nayar. “The first time I heard him speak was after the Emergency when he addressed students at a late night mess meeting at JNU…I can’t recall a single meaningful public activity that he wasn’t a part of. 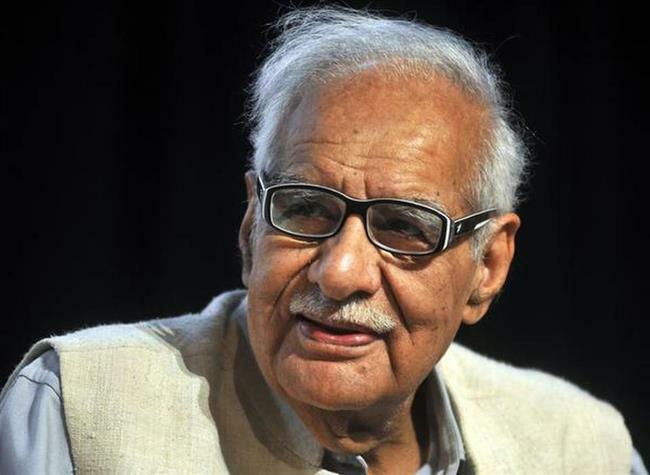 For me, the idea of India is Kuldeep Nayar. Today, when the foundation of the republic is shaken, we need to look up to him and aspire to be like him. He was truly the voice of the nation,” Yadav said. Survived by his wife Bharti and two sons, Nayar was born in Sialkot (now in Pakistan) in 1923 and graduated in Law. He also studied journalism and began his career with an Urdu newspaper called Anjam. His grandson-in-law Ratish Nanda said, “He was extremely spirited, high on integrity and was actively writing at this age. We just celebrated his 95th birthday with a family dinner. Irrespective of the age gap, he was a friend. Dinnertime conversations with him were all about what needed to be set right”. Nayar authored 15 books on various subjects, including India-Pakistan relations, Afghanistan, Operation Bluestar and Bhagat Singh among others. Eminent photographer Raghu Rai, who worked with him in the 60s and 70s, recalled the time when Nayar had asked him to take his photograph for his autobiography Beyond the Lines. “For his autobiography Beyond the Lines, he asked me if I could take his photograph. I told him, ‘you don’t have to ask, you just have to order’. He was the kind of editor one would get in arguments with, and then he would come to my room and fix it, say sorry…he had no ego. He just wanted good, honest work,” Rai said. Also present at the cremation ground were social activist Swami Agnivesh and child rights’ activist and Nobel Peace prize winner Kailash Satyarthi. Agnivesh was a part of the delegation led by Nayar that went to Pakistan during Benazir Bhutto’s time. “Bhutto said something anti-India and I got up to walk away…he calmed me down and gave a fiery speech later on. He was a pragmatic man. In 1994, we lit candles at the Wagah border…he was all about maintaining peace with Pakistan. I visited him in the UK when he was the High Commissioner of India there,” Agnivesh said. Shiromani Akali Dal (SAD) leader Naresh Gujral recalled the friendship that Nayar and his father IK Gujral enjoyed, and said, “He advised me to not be taken in by early gains, I remember this very well. Even after the 1984 Sikh riots, he attempted to broker peace between the Hindus and the Sikhs”.ts to Nayar and the legacy he left behind.